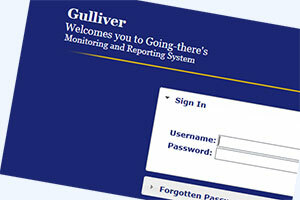 Gulliver is Going-there’s proprietary operational database. It’s how we can guarantee compliance with our client agreements and optimal assignee service progress and where we keep confidential information in a secure, company controlled location. It's also how we report back to you. Within Gulliver, every assignee file is connected to our corporate SLA as well as client-specific documentation. Our Regional Operations Managers and GT Destination Consultants access this information through the secure portal and have all the information at their fingertips to deliver the service request exactly as expected.